Are you a Windows 7 or 8.1 user tired of seeing Microsoft’s incessant taskbar pop-ups prompting you to upgrade to Windows 10? Here is one simple trick that will you to stop showing Windows 10 upgrade prompts in Windows 7 and Windows 8.1. Microsoft is pushing Windows 10 upgrade option more vigorously, the most annoying part of all this is the constant taskbar pop-ups asking you to upgrade to Windows 10. Recently company revealed that users who are running Windows 7 Pro or Windows 8.1 Pro can expect to start seeing the Get Windows 10 app in their taskbar, suggesting that they upgrade to the new OS. • In Windows 7, type ” run ” in search box and select the Run program from the results. In Windows 8.1, its simple press ” Windows Key + R ” to open the Run program. • Next step is type in ” regedit ” in Run program and tap Enter to open Registry Editor. This will create a new entry in ” HKEY_LOCAL_MACHINE > SOFTWARE > Policies > Microsoft > Windows > WindowsUpdate “. • You have to give the new entry the name “ DisableOSUpgrade ” and then hit Enter. • Next, double click on the ” DisableOSUpgrade ” entry you just created, and in the new window that opens set the Value data: to 1, click OK.
• Now go to ” HKEY_LOCAL_MACHINE > SOFTWARE > Policies > Microsoft > Windows “. 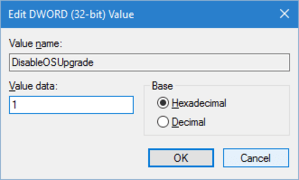 Again create a DWORD by clicking ” Edit > New > DWORD (32-bit Value) “. Give this new entry the name “ DisableGWX ” and then hit Enter. • Once again, double click on the ” DisableGWX ” entry, and in the new window that opens set Value data: to 1, click OK, and then close the Registry Editor. • Now reboot your system and that should be it. You successfully hide Windows 10 upgrade prompts in Windows 7 and Windows 8.1 forever. Tell us if you find above method helpful and feel free to ask your doubts in comments if your stuck in the middle of the process. Found that the only way to stop the nag and prevent it from returning was to turn off windows updates after cleaning the system of the GWX and downloads, otherwise it just keeps coming back, even if the original update was hidden. Especially since Microsoft keeps forcing it down to users with the monthly updates. We have turned updates off on thousands of computers and rolled back thousands more by people who got suckered into installing it when they didn’t want it. I trusted Microsoft not to put junk on my system I didn’t want and they violated that trust so why would I recommend that anyone follow any advice they give in regard to Windows 10.